A food truck that's always there when you need it. Features amazingly delicious tacos and barbacoa in town. This is the best drunk food stand. It's located in the same lot as THE LOT, the tacos are cheap two bucks a taco, decent sized, and filled with meat. If you want a good taco, forget the new wave taco trucks. 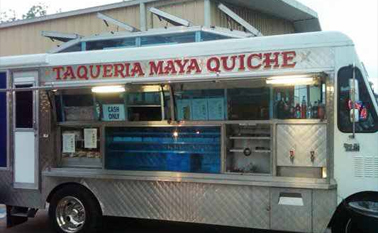 Taqueria Maya Quiche, aka taco truck outside The Lot, is delicious.